The Maiden Chemise is a uniquely stylish blouse inspired by medieval peasantry. Handmade from 100% muslin cotton, this brown chemise is a soft and breathable top that can be worn for a variety of historic reenactment looks. 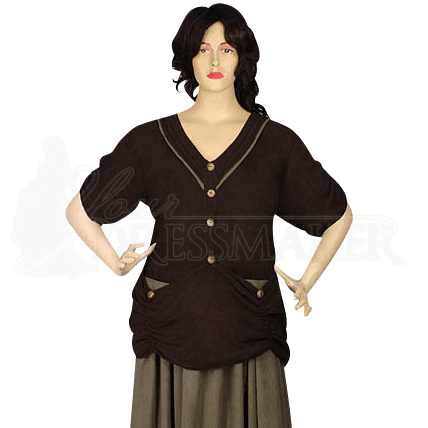 Its V-neck shape is embellished with a contrasting fabric detail, and rustic round buttons decorate the front. Two pocket details appear on either side of the front, ending in a unique gathered style. Wear this historic chemise with your favorite long, full skirt for a stylish take on medieval peasant garb.